Do you know of any freeware or low cost circuit / PCB design software? I know a few which I have listed below but I was wondering if there were more of its kind. Please mention the good features and issues you've faced with the software. Kicad is free and open source, and it is a relatively well-integrated package of schematics and layout editor. gEDA is free and open source. It is older than Kicad, has more tools which produce nicer output, but is less well integrated. Since they are open-source packages there are no arbitrary restrictions on the free version (like e.g. board size in Eagle) and no license hassles. Eagle seems to be the most popular free PCB tool. This may not count as a PCB design software, but it takes a new, creative approach to circuit and PCB design, and lets you prototype around with a breadboard view. It's called Fritzing and there are versions for Windows, Linux and Mac. It is available for non-commercial use in a limited form (250 pins) for free and then hasd a scale of different costs depending on use and scope. I have tried Eagle and find diptrace easier to use with a fairly extensive library and more importantly an easy to use parts designer. I have used this to create gerbers which I had turned into PCB's with no issues whatsoever. I use gEDA/PCB. The file formats are open an ASCII. The open file formats make a wide variety of EDA automation tasks possible. The ASCII format makes them easy. I have switched from Eagle to gEDA/PCB. I have found gEDA to be a more productive tool. The schematic capture is better but the PCB layout seems more difficult. The scriptability is what has made the difference. There are also tools for simulation. Be careful of choosing a free version of an EDA tool that is crippled or a tool that locks you in to a specific PCB vendor. There is a learning curve associated with any EDA tool or other complex piece of software. It will be very time consuming to switch tools. The footprint library that I use is available at http://www.lucianifamily.org Also I have a variety of EDA automation scripts on my site. The latest version of our free PCB design-tool has an intuitive CAD interface that lets you create new PCB designs quickly; offering freedom and flexibility in your schematic and layout editing. Ability to import net lists from multiple CAD vendors. 145,000+ parts in the library. Two-, four-, and six-layer support with soldermask and silkscreen. Easy PC from Number One Systems works really well for small/medium sized projects, it supports multi-layer PCBs, includes a Schematic editing tool, and has an entry level Autorouter, or you can buy the pro Autorouter as an addon. Grab a free demo from their site. PCB routing by hand is quick and intuitive, and you can create the netlist right in the PCB editor itself, by simply wiring any pin to another. All unconnected wires show up as a ratsnest. Then as you connect wires with tracks, the ratsnest line disappears. Mentor PADS is another one with a free eval. It has unlimited size and 8 layers. Its limitation is the number of devices: 30. It's based on Easy-PC, but the files are not compatible. If you don't need gerber output, the demo of omnyglyph (formerly circad) at http://www.holophase.com/ should be enough. I've used this almost unknown software from the very first version for MS-DOS. I use ExpressPCB, which is a free unlimited software package that allows you to design schematics and PCBs. You can also send off your design to ExpressPCB and they'll manufacture the board for you. I'd like to recommend EasyEDA.It's a free web based PCB tool for anyone involved in electronics design and able to share the work with others. I have been using EasyEDA for over a year now with great results. The most startling things about EasyEDA are not just that it is free up to the point where you want to physically buy a (low cost) PCB directly from EasyEDA but that, unlike ExpressPCB and some others, you are not tied into buying the PCBs from EasyEDA: you can download Gerbers and send them off to any PCB fab house at no charge from EasyEDA. It has some pretty impressive import (and export) options. For instance it can import schematic and PCB designs from Altium and Eagle. Library import from KiCad is also provided. EasyEDA also has good simulation support using ngspice. Many LTspice simulations can be run in ngspice with little editing effort. I want to put in another pitch for Circad now OmniGlyph. I've used it since it first came out. I started out with OrCAD when it was new so that gives you an idea how long I've been pounding away on CAD systems. I tried to use Tango (Didn't care for it), Protel and ahhhh my memory is really fading. Schema? I think thats what it was called. I like the simple ascii format files. *And the format is not some secret format. I hate buzz words like "seemless" but it does take you from schematic to PCB with a perfect pass fail on your connections. Or to make it simpler... All the connections on the Schematic get to the PCB which is the point. And lost btw on so many other CAD systems. I also like that this program is not a constant mouse for this keyboard back and forth. And on that topic its not filled with Left Shift h type keyboard commands. You can mouse around or type. (its all optional either way) The non secret file format is valuable if you want to parse our things or replace components or any other thing you can think up. Tech support is better then any other program I've seen. It clear that English is the primary language (Not Indian) and whoever you speak to has (for me) the answer or gets the correct one back asap. Oh, this might just be an impression I got, but I've reported a couple things (One that was an obscure bug) It got fixed in days and I got an email sending me the fixed version. This happened in DAYS!? And NO I'm not kidding. I don't know if that happens all the time but I know for sure it doesn't happen with any other software I own. I've heard second hand about feature requests being added which totally blows my mind. Windows is updating weekly but that seems to be mostly to slow my system and only causes new improved screens of death. I forgot the last maybe most important thing. Its unbelievably small (Thus Fast) and setup can be as easy as making a directory any putting OmniGlyph into it. So - Backing up everything (Program, Libraries, Schematics, Mechanical drawing parts etc) fits on a thumb drive (And you can tun it from that btw) So if Windows coughs up a furball your back up running instantly. Or at least as fast as you can fix or reinstall windows. http://tech.groups.yahoo.com/group/CIRCAD/ I think I was trying to understand an 8080 memory test program. My company primarily works with PADS and Eagle, so +1 on recommendations for those. However, as mentioned, not free! 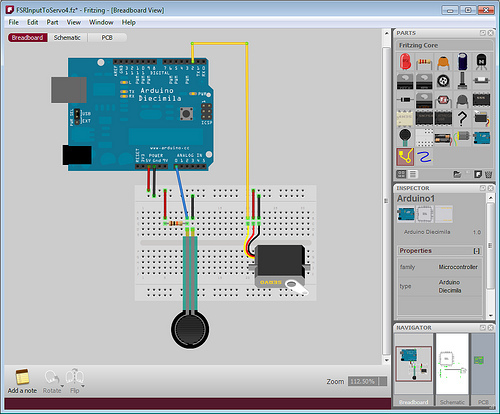 Fritzing and Diptrace are both worthwhile to take a look at. Not the answer you're looking for? Browse other questions tagged software pcb design development or ask your own question. KiCAD vs gEDA vs other open source CAD? Which is the best PCB software to generate gerber file? What are the important design considerations when laying out a PCB? Useful mental models for low-frequency analog circuit design? What is a good project for amatuer PCB designers?